We’re making Marinara sauce tonight. 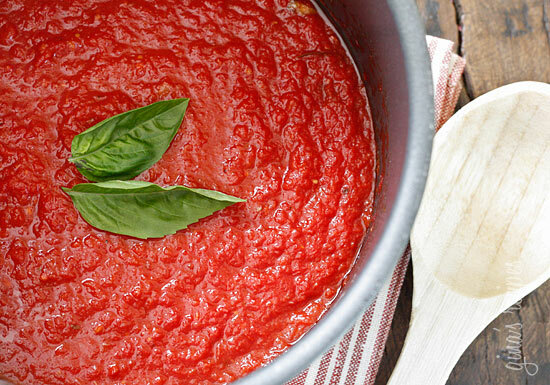 Marinara is the perfect tomato sauce, because it is easy to make; incredibly tasty; and very, very versatile. There is, however, a catch (of course, what else would you expect from Cheffy? The catch is, only fresh ingredients. I will accept nothing less. Okay, okay, I didn’t grow the olives, sugar cane, pepper pods or mine the salt, but you get the idea. But I’m going to suggest one thing to you that you may not have considered: San Marzano tomatoes. You can get San Marzano seeds from a heritage seed project, and these are the best tomatoes to use in a Marinara sauce. If you can’t get San Marzano’s, make sure to use a really good, solid Italian plum tomato. If you grow tomatoes, grow lots, and keep them. Either put them up in jars or roast them (45 minutes at 350 degrees F. brushed with GOOD olive oil), pick out the skins, and freeze them in quart-size freezer bags. If you haven’t used these tomatoes for sauce, you have missed the absolute secret of authentic tomato gravy. Google “San Marzano tomatoes” and read all about them. You haven’t lived until you have tried these babies. Try this. If it isn’t better than your sauce, give me your recipe. 6 garlic cloves, smashed on a cutting board, but NOT CHOPPED UP! 1/4 cup chopped fresh basil — Please, PLEASE, don’t use dried basil. 1/4 cup chopped fresh flat leaf (NOT CURLY LEAF) parsley – Ditto. salt and pepper to taste. Taste while you’re cooking. In a large saucepan, heat the oil. add the garlic and cook over moderate heat, stirring occasionally, until golden, about 5 minutes. Add the tomato paste and cook, stirring, for one minute. Add the tomatoes with their juices, stir in the sugar, add the basil and parsley, season with salt and pepper and bring to a boil. Simmer the sauce over very low heat (just barely bubbling), stirring occasionally, until it thickens and is reduced to 3 cups, about 30 minutes. Season again with salt and pepper. sauce uncovered, until it is reduced to about three cups. Enough for one pound of pasta. Double the recipe for one lasagna, and save the leftover sauce. * Don’t you dare skimp on the olive oil, either in amount or quality of the oil. This is Italian gravy, for gosh sake! * About the tomatoes, San Marzano tomatoes can be found in 28-oz. cans (usually at Italian markets), and they are an acceptable substitute for fresh tomatoes, but they are the only canned tomatoes to use for authentic marinara. If you use these, add one fresh tomato from your kitchen, but remove the skin. Also, if you are buying cans, buy the whole tomatoes and break them up with your hands in a bowl. If you do use canned San Marzano’s, make sure to taste as you go. They are canned without salt–the only canned tomatoes that are canned without salt. * Also, I have recently discovered San Marzano’s in more than one garden store. Hooray! Here’s what I do: I grow a couple of San Marzano vines in my garden like any other tomato, and freeze them. Simply harvest when they are ready, and when you have enough to fill a heavy 9×13 roasting pan, rinse them thoroughly, place them stem-side down in the pan, cut an X on the up side, spray them with a bit of olive oil spray, and roast on the grill for 45 minutes. Cover the tomatoes with brown paper and allow them to cool completely. Then peel off the skins and make 1-pound bags of quart-size freezer-safe zip bags and freeze them. You ought to get three or four bags from a roasting pan. If you keep doing this all summer as the tomatoes ripen, you will have enough to get you through a cold, hard winter full of sauces and stews.